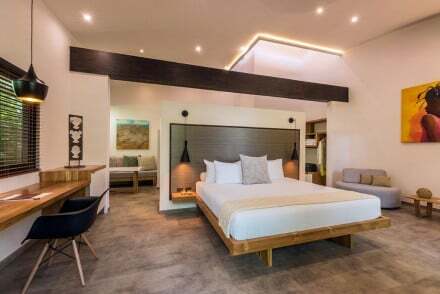 A contemporary boutique hotel boasting an enviable location in amidst the rainforest and walking distance from a white sand beach. Chic rooms are light and airy with soft hues, plenty of glass and luxurious bathrooms. Spend days spotting exotic wildlife or surfing the waves. Fabulous. Active Holiday - The coastal rainforest positioning provides the perfect terrain for numerous outdoor pursuits. Sailing - Take a half or full day excursion in one of the hotel's boats and choose to snorkle, fish or dive. Surfing - The hotel offers lessons and Tamarindo beach is perfect for beginners.